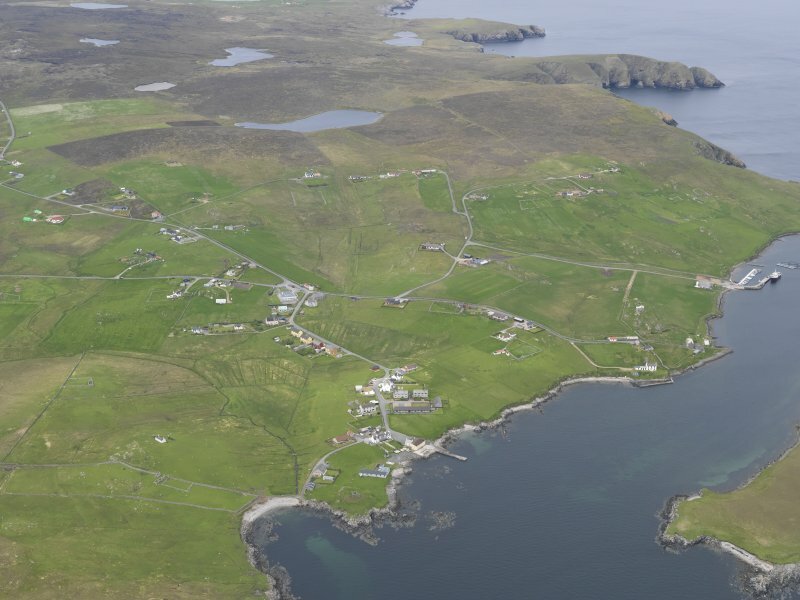 General oblique aerial view of Burravoe, looking NNE. General oblique aerial view of Burravoe, looking N.
(HU 5201 7951) Old Hall of Brough (LB). A featureless, rectangular harled building, 50' 6" long by 21' 6" broad externally. The gables are crow-stepped and each of the lateral walls has at sometime been strengthened by the addition of two heavy buttresses. The major axis lies N-S.
On the west, until they are interrupted by the roadway, the side walls of the courtyard can still be seen projecting from the gables with which they are in alignment. The surviving length of the south wall includes the original gateway which bears an armorial panel with the date 1672 - presumably that of the completion of the Hall - and the initials 'R.T.' for Robert Tyrie. A 17th century house, still occupied, of no particular significance, as described by the RCAHMS. This 17th-century house was built at a point from which all boats attempting to enter the shelter of narrow Burra Voe could be monitored, and the original track to the shore passed through its courtyard. The modern road passes just south of the intact east entrance, but the rest of the courtyard has been demolished. The house has been restored and contains a local history exhibition. An excellent example of a laird's house, this is a substantial rectangular building with crow stepped gables from which the remains of the courtyard walls project on the south-west side. At some stage it became necessary to strengthen the long walls of the house by adding massive buttresses, which do little to alleviate its stern exterior. The wooden porch is modern. The gateway in the south wall of the courtyard has a rounded arch above which is an armorial panel within a moulded stone surround; it bears the date 1672 and the initials R T for the laird, Robert Tyrie. 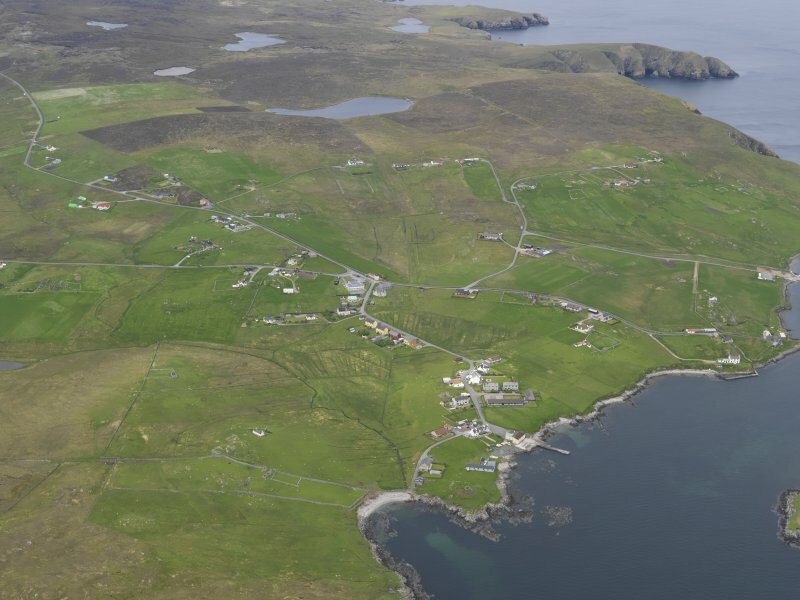 In the early 19th century an old trading booth on the shore of Burra Voe was still owned and operated by the family living in the Old Haa, selling goods imported from Scotland. Robertson's Stores at the pier is a 19th century warehouse, but, along the shore to the south-west, a broad stone-built arch attached to a modern shed is all that survives of the old booth. On the promontory beyond is a large mound covering the remains of a broch and topped with a good example of a skeo for drying fish.